RV vacations are the quintessential American getaway and have been for years. Cruising the country’s highways provides ample opportunities for adventure, and frankly, there is nothing like a good old-fashioned road trip. However, in an era where high tech gadgets and gizmos seem to be infiltrating all aspects of life, there are certain old-school travel tools that will help make your next road trip that much more fun and enjoyable. Consider the following 4 classic items as you prepare your RV for the open road. Nowadays, maps are accessible at the click of a button. However, nothing will ever replace the aesthetic and utility of a good old-fashioned atlas. Having a quality set of maps in your RV has many great functions. An atlas can provide hours of entertainment and education for passengers as they flip through the pages while you cruise down the highway. Additionally, a wide selection of detailed maps can open your eyes to unique opportunities and side-trips that would otherwise be lost on the Point A to Point B navigation of a GPS. Finally, and most importantly, an atlas doesn’t need Internet, reception, or batteries. If you find yourself back in the woods or stuck in a bind you can always count on this handy tool to point you in the right direction. Every good traveler has a deck of cards on hand but, with an RV, you have plenty of space to expand your gaming catalogue. From road games that make hours behind the wheel fly by to a good selection of board and card games for rainy or rest days, quality games will improve any road trip. Next to getting away from it all, spending time with people you care about is a top reason to go on an adventure, and there is no better way to spend time together than an evening of friendly competition! Tired of reading or playing, listen to music! Next to the driver the second most important person in the RV is the navigator/DJ. From 8-tracks to CD players, the soundtrack has always been a crucial aspect of any road trip. However, for this category and this category alone, I will bow down to the technology overlords. Before you hit the open road, stock your iPod or mp3 player with a large and eclectic selection of music and bring your entire library along in your pocket. One of the biggest perks about traveling in an RV is having a mobile kitchen. When you stop for lunch or decide to set up camp for the night, the convenience of having a full kitchen is absolutely unrivaled. To make the most of your galley, consider purchasing an RV cookbook. The travel specific recipes in these books will provide you with fun, affordable, and easy recipes that are sure to satiate your family, traveling, companions, and any friends you meet along the way. 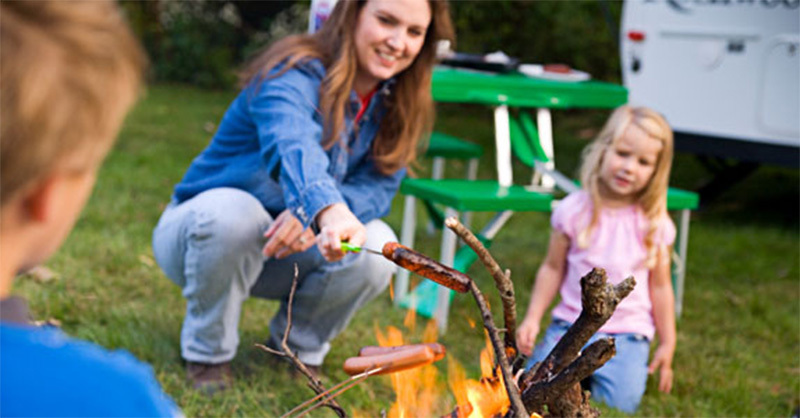 At Expedition Motorhomes we provide plates, pans and a bbq for a small fee. At Expedition Motorhomes, we provide a lot of advices to plan your trip and make it unforgettable. Contact Us for more information or Book your RV directly.